Using library-licensed materials, including books, eBook, and electronic journal and magazine articles for course instruction, or making use of library course reserves. These materials have already been purchased by libraries or institutions, but are no-cost to students. Using existing Open Educational Resources for course instruction and/or modifying/enhancing existing resources. Creating open content that can be used by students you are teaching or by other instructors or scholars. Institutional efforts to negotiate across-the-board lower costs for traditionally-published textbooks and materials. 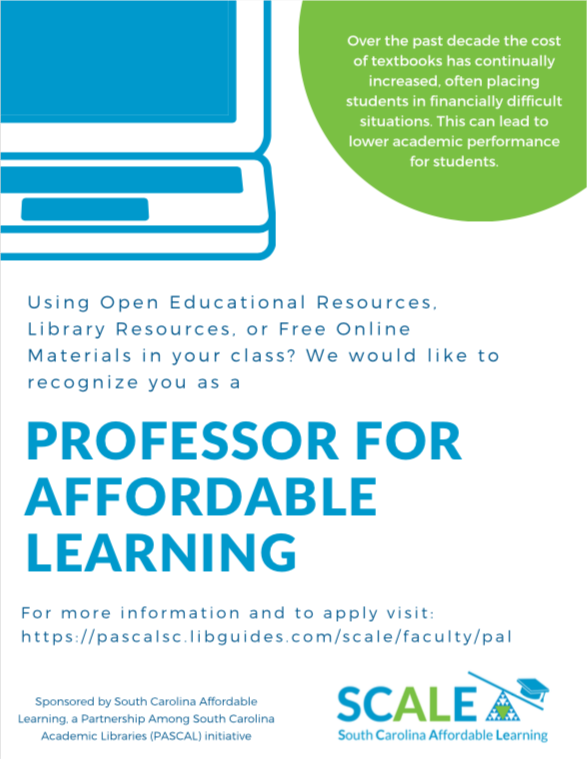 Partnership Among South Carolina Academic Libraries (PASCAL) has launched an affordable learning initiative called South Carolina Affordable Learning (SCALE). Jackson Library is teaming up with them to help cut higher education costs for our students by helping you to find and adopt affordable course materials. Learn more about SCALE's programs and resources on their website.